CAPTION: "Photo courtesy FreeDigitalPhotos.net." 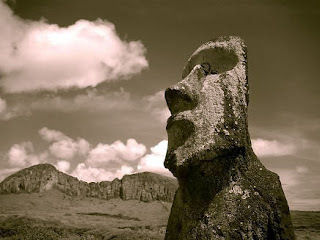 Photo of a massive statue taken from Easter Island. The mysterious island is one of the most isolated places in the world. The island is located over 2,000 miles from the nearest population center, (Tahiti and Chile). For those of you who are new, every once in a while we post the Feature Photo, a cool or beautiful photo for everyone to view. We hope that you enjoy this one (above) of Easter Island. To view all of the other feature photos we have posted at Harmony of the Heart simply click here. Also, if you are new to the site and want to learn more about us click here.